The facelift also known as rhytidectomy can not prevent the aging process. However, it can help set back the aging clock by improving the visible signs of aging through the removal of excess skin, fat, tightening of the muscles, and repositioning the skin of the face and neck. A facelift can be performed alone, or in comination with other surgical procedures such as eyelid surgery, forehead lift, or a rhinoplasty. If a person is considering a facelift, understanding the basic principles of the procedure can help them understand how it is performed, and the types of results they can expect to receive. Total Facelift – Superficial Musculoaponeurotic Technique (SMAS). 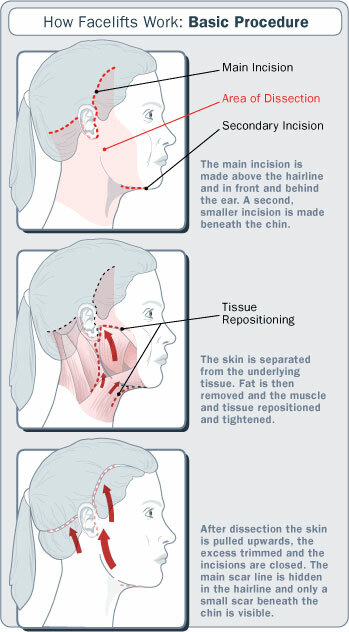 This technique focuses on the connective tissue or the superficial musculoaponeurotic structre of the face. The connective tissue is tightened with the outer surface of the skin becoming smoother and more youthful looking. It also has the benefit of not making the face look like it has been surgically tightened. It is also effective at getting rid of the deep creases around the nose and mouth or nasal labial folds. Subperiosteal Facelift – Is known as giving patients the most lasting results. This technique tightens the deepest facial tissue and is done with an endoscope. However, this technique is also known for causing more facial bruising, swelling and a longer recovery time. Deep Plane Facelift – This technique is the least invasive. It primarily adjusts the entire face and neck by lifting the facial tissue, skin and the underlying fat. This technique is performed quite frequently with exceptional results. However, the recovery time for this procedure can be quite long as well. Mid Facelift – This technique is also referred to as the cheek lift because the procedure is focused primarily on the cheek areas, right below the eyes. This type of facelift is best for problem areas around the nasal labial folds and fat deposits that droop in the cheek area. Thread Lift – This is one of the newest techniques and is known by a lot of different names, however, it’s long term effectiveness as a qualified procedure has yet to be determined. This procedure requires the surgeon to use barbed threads which are passed through the dermal layers of the skin and then cinched up near the ear. The tension of the barbed surgical threads then keep the facial tissue in place. Typically the results provide a smooth facial appearance. Dr. Park is a board certified plastic surgeon specializing in cosmetic and reconstructive plastic surgery.